Joanne Kathleen Rowling was born in Chipping Sodbury, England in 1965. She began writing at the age of 6 with a story called ‘Rabbit’, which she never finished. In high school her favorite subject was English. From High School, Rowling went to Exeter University where she earned a degree in French. After graduating, she spent a year studying in Paris and then went back to London where she worked in a number of jobs, including a year with Amnesty International and a short time as secretary for a publishing company, where she was responsible for sending out rejection slips. In the summer of 1990, on a delayed train from Manchester to London, she came up with the idea of a boy who discovers he is a wizard. But it would be 7 years before the idea became a book. In that same year her mother died of Multiple Sclerosis and she left for Portugal to teach English, hoping to find a way to deal with her grief. In October 1992 she married a Portuguese television journalist, Jorge Arantes. But the marriage lasted just eleven months. In 1993 she left her husband and returned to England, with the one legacy of her failed marriage – an infant daughter named Jessica. Her life suddenly took a nose-dive. Fighting poverty and depression, she lived in a mice-infested flat in Edinburgh and struggled to raise her baby daughter on a welfare check of 70 pounds ($100) a week. Unable to heat her flat, she sat in cafés nursing an espresso for 2 hours at a time and worked feverishly on the manuscript of ‘Harry Potter and the Philosopher’s Stone’ while her baby daughter slept in a pram. The manuscript is said to have been rejected by three British publishers – Penguin, Transworld and HarperCollins. But Bloomsbury Children’s Books did sign her up, reportedly paying £10,000 ($14,300) for the rights to ‘Harry Potter and The Philosopher’s Stone’. The Philosopher’s Stone was published on 30 June, 1997 and was an instant success. The book was published under her initials because her publisher feared that boys would be less likely to read the book if they knew it was written by a woman. At a book fair in Italy later that year, Scholastic Books bought the American rights for $105,000, an unheard of figure for a children’s writer with only one book to her name. It was published in the States in 1998 with the title ‘Harry Potter and the Sorcerer’s Stone’. The sequel – ‘Harry Potter and the Chamber of Secrets’ – was published in June of 1999 and later that same year, the third book in the series was released, ‘Harry Potter and the Prisoner of Azkaban’. 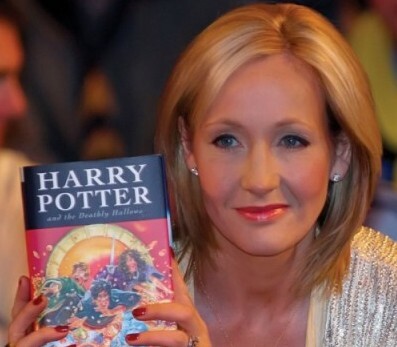 By the time her fourth book appeared in 2000 – ‘Harry Potter and The Goblet of Fire’ – the series had become an international phenomenon: the initial print run for her 4th book was 1.5 million copies in the UK and 3.8 million in the US. By 2000, JK Rowland had become the highest-earning woman in Britain, with an income of more than £20.5 million ($29.3m) in the previous year. In 2001 her annual earnings were estimated at over £24m, ($34.3m) placing her between Madonna and Paul McCartney in the ranks of high-earning celebrities. In October 1998 Warner Brothers bought the rights to ‘Harry Potter and the Sorcerer’s Stone’ and its sequel (‘Harry Potter and the Chamber Of Secrets’), for the tidy sum of $700,000. With the release of the first Harry Potter film, J.K. Rowling’s total earnings are estimated to have exceeded $100 million. In March 2001 she was awarded an OBE (Order of the British Empire) by the Queen, for services to children’s literature. This success story confirms that the winner never quits. JK Rowling is truly an inspiration of tenacity and dedication. Stumbled on this blog while searching for some inspirational stories. I must say, i loved going through it. Very interesting life story of J.K. Rowling. I am a great admirer of her. J.K.Rowling’s life story gives me strength. It’s very encouraging story. I admire her too. She is an inspiration to many young guys and gals…..she proved yet once again that realising our dreams and struggling for our goals is more important than simple relations…..she proved yet again that we can be an inspiration to an entire generation if we just succeed in reaching our goals. I must say that I never knew the story behind JK Rowlings success. When a motivational speaker spoke to our sales meeting and mentioned that JK Rowlings went from welfare to a millionare I decided to track her story down. Wow, I am glad I did. I also found her commencement speach to Harvard that really inspired me. It was a wonderful inspiration. Thanks for publishing her story! God gives oppurtunity to everyone.one should make use of it.my heartiest wishes to u.being a girl i feel proud of it. I am a writer in Mississippi .I had heard that she was in dire straits financially. She is my shero and gives me the strength to keep writing no matter what.